I had the great opportunity whilst working in the San Francisco Bay area to visit some fantastic restaurants and experience the vibrant food scene – a food blogger’s delight! I did some prior research but always prefer to ask locals for their recommendations, taking advantage of home city knowledge. There were too many interesting places and stories to do it justice in just one post. I will be posting about restaurants, bakeries, coffee culture, the lunch/brunch scene as well as my speed wine tasting/buying challenge in Napa Valley & Sonoma in the coming weeks – so watch this space. Thanks to John and Elizabeth for these top picks in part 1. 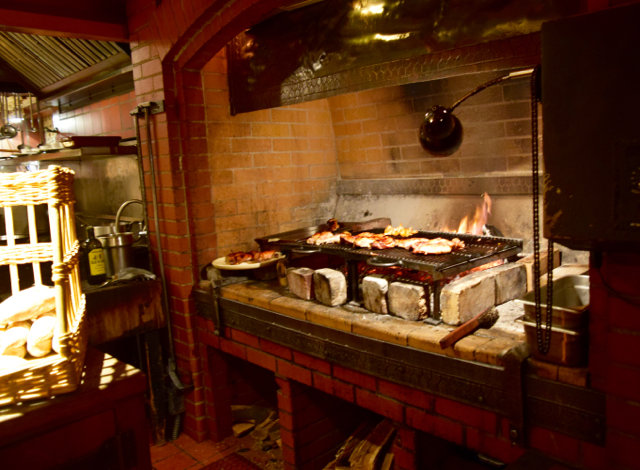 My first is the legendary Chez Panisse, in Berkeley, CA 94709 that just had to be on the top picks list. Alice Waters- chef, restauranteur, author is a true innovator, influencer & pioneer introducing us to the farm to fork concept in the 1970’s using organic, locally grown ingredients sympathetically handled for maximum taste, a sustainable, healthy environment whilst supporting the local communities. 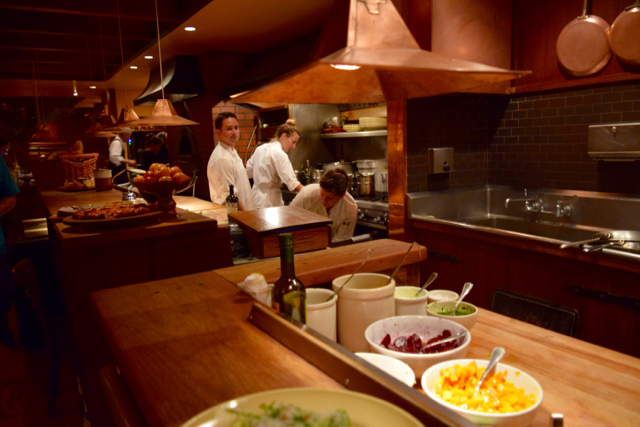 I managed to get a reservation at the Chez Panisse Café upstairs, with the flagship restaurant downstairs fully booked for the next month. The Bay area is very blogger friendly & I always ask if I can take photos of the food out of respect as I don’t want to spoil the ambience for the other diners or restaurant. I think that degree of respect plus my ‘out of town’ British accent & being such an enthusiastic foodie is important and does help. 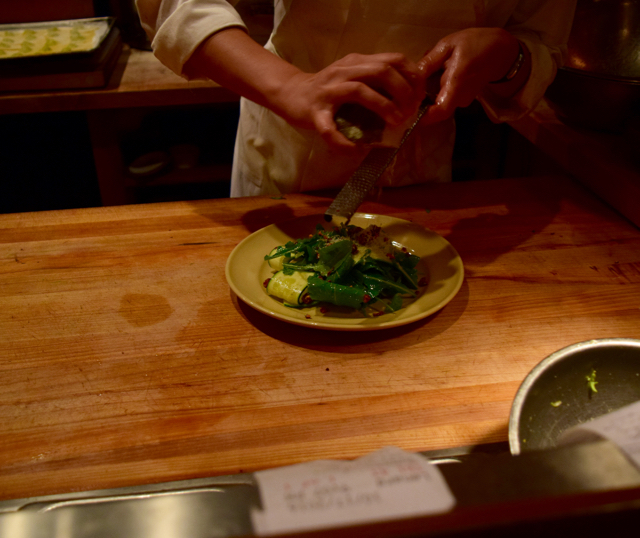 I was treated like royalty by Mark, the host at Chez Panisse Café who guided me upstairs & downstairs to take photos of the open kitchens & chat to the chefs. I even watched my appetiser (starter) being prepared! I had a great chat with Leonard my waiter who is also a playwright & talented quilt maker! My first ( of many) questions was please can he explain the ‘Garden lettuces’ appetiser as it is something I have not seen in London, but a few times in California. 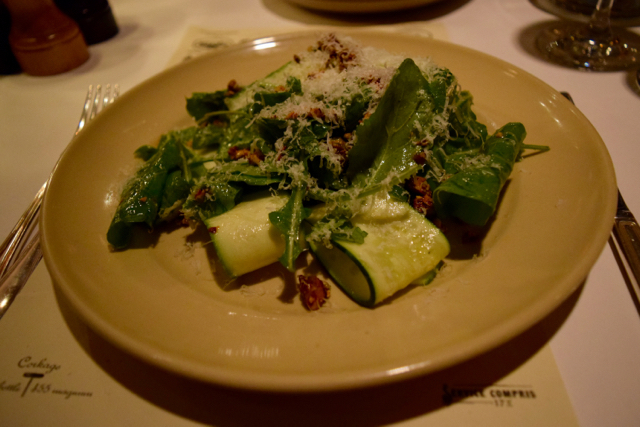 Leonard described where they were grown and it being a simple, light option where the lettuce truly is the hero, although I opted for something with a few more ingredients and chose the Cannard Farm rocket with shaved zucchini (courgette), mint, spicy pistachios & Pecorino. It was light, refreshing, with great layers of complimenting flavours and the slight warming spice & creaminess of the pistachios that brought everything together. Simple, tasty with great textures too – a wonderful salad that sums up the Chez Panisse approach to good ingredients, handled in the right way to create a brilliant dish. I know I am enthusing about a salad but it really was that good! 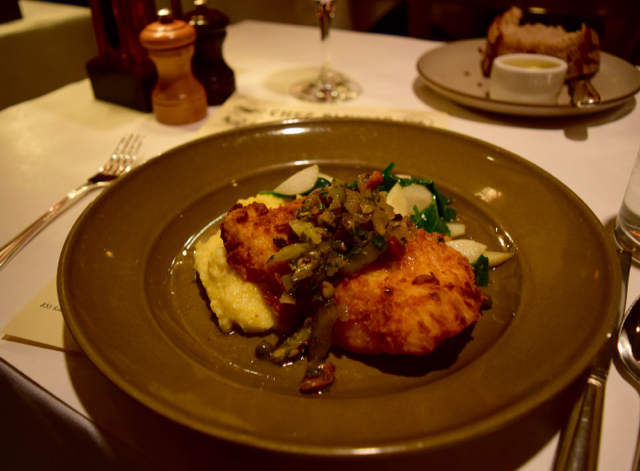 For main course, Leonard suggested the buttermilk fried northern halibut ( one of my favourite fish) in stemperata – an Italian sauce typically made of capers, onion, tomato, garlic and olives. It was served with spinach, mint, almonds & green olives. I am not a great fan of ‘battered or coated’ fish however this was something special. Biting through the thin, crisp tasty crust revealed the white flaky, meaty fish, perfectly cooked & seasoned. The accompaniments really enhanced the fish without overpowering it. I had a glass of Chez Panisse Green & Red Vineyards, Napa Valley Zinfandel wine as I explained as a European visitor I was keen to try local Californian wines if possible and it was the only local red available by the glass. I’m a fan of red wine especially with a meaty fish such as halibut and the slight spiciness of the wine worked with the dish. My dessert of crème fraiche panna cotta with huckleberry coulis, ginger snap topped with Meyer lemon candied peel was stunning. 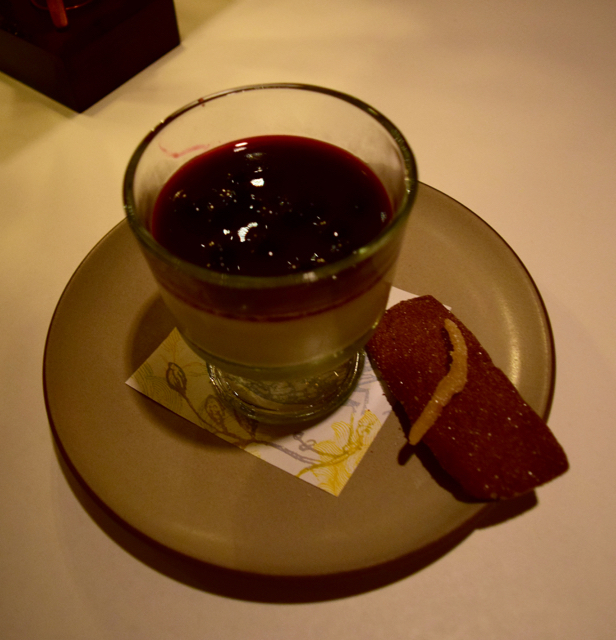 From the perfect panna cotta ‘wobble’, the acidity from the crème fraiche, huckleberries and lemon and the warm spiciness of the ginger snap – a great taste combo! All in all a fantastic meal, brilliant customer service and a thoroughly entertaining evening. I got chatting with my next door diner who seemed to know all the staff. 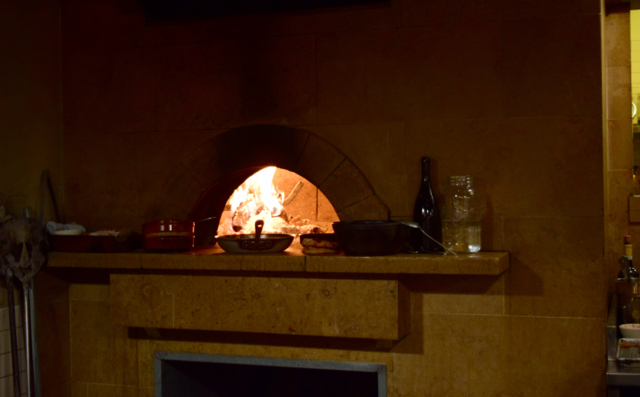 Elizabeth, an opera singer, used to work at Chez Panisse – so she did! Leonard, Elizabeth and I chatted over dessert and the conversation covered food, travel and also politics – as the US Election campaign was in its last few weeks and the consequence for the UK voting for Brexit and future implications led to a lively debate. Elizabeth also recommended my next restaurant pick, as her friend Russ, used to be a chef at Chez Panisse for over 20 years. 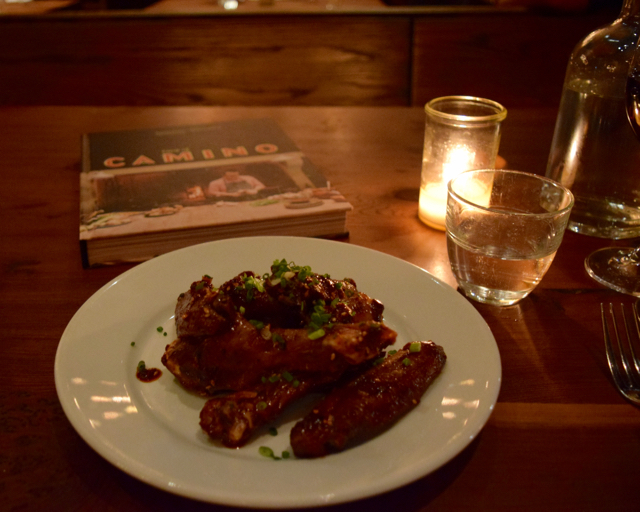 Russell Moore chef/owner opened his restaurant Camino in Oakland,Ca 94610 with his wife & partner Allison Hopelain in 2008. 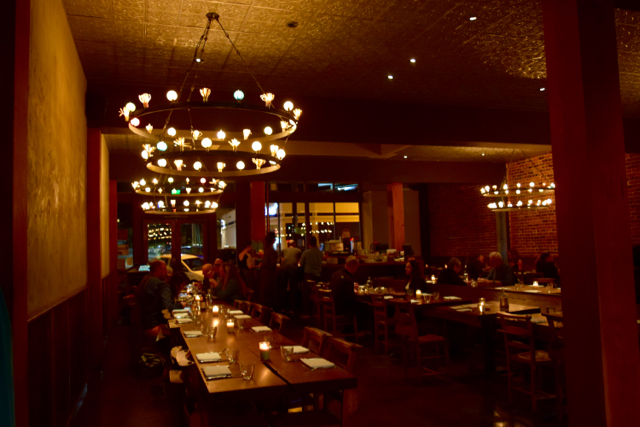 The restaurant decor has a slight nod to the Medieval with its lights and wooden tables but done in a contemporary way. 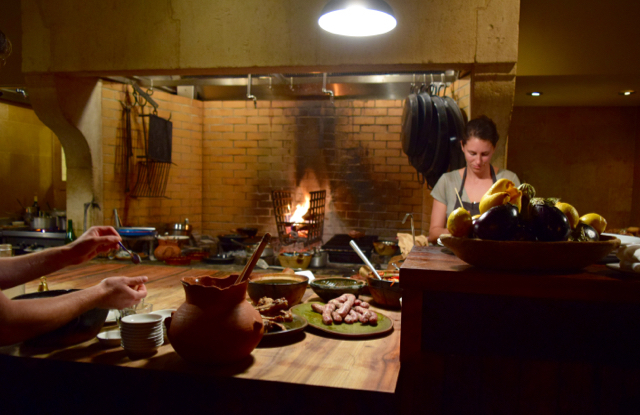 With slightly dim lighting you are immediately drawn to the open kitchen at the back and the enormous fireplace hearths, open fires & piles of wood – this is all about cooking with fire – in it, near it & in front of it. Brandon the chef explained that the oven can reach 600 F (315 C) in some spots and 400 F (200 C) in others so it is so important to get to understand this approach to cooking. There is also a ledge at the front for gentler heating. Alison the host also mentioned that Russ was actually dining in the restaurant and as I am an avid collector of recipe books I could not resist buying the Camino cookbook and getting him to sign it as a memento of the evening. So what about the food? Elizabeth raved about the cocktails so I chose a non alcoholic shrub which are bang on trend in London. A shrub is a drink where drinking strength vinegar is used to macerate fruit to bring out the flavours with a balance of fruity/sweet & acid/sour tastes. It sounds a bit odd but think of fruity salad dressings that work in a similar way. I had the ‘Freedom’ – with rosemary, lime, grapefruit & strawberry. It was fab and a refreshing way to wake up my taste buds ready for dinner. 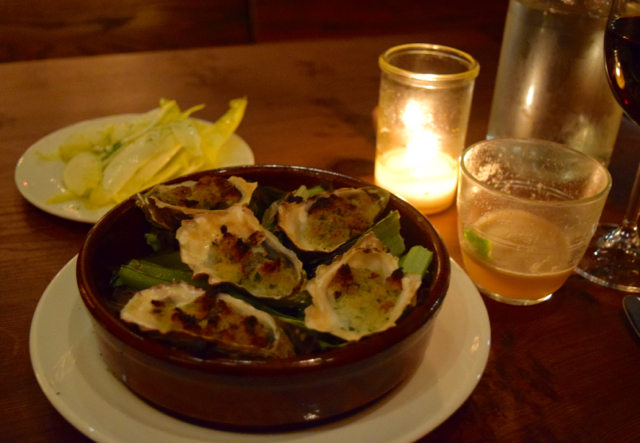 To start I had the wood oven-baked local oysters with absinthe, breadcrumbs & endive salad which were delicious. Oysters are a bit like Marmite – love them or hate them – I am definitely a fan. They are difficult to describe in flavour and texture however I love the quote from a French poet who described the experience as like ‘kissing the sea on the lips’. Baked oysters are a great introduction if you are reluctant to try them raw and Camino have created a delicious appetiser. The anise flavour of the absinthe enhanced the taste of the oyster along with the hint of smokiness from the wood fire method of cooking, the crunchiness of the breadcrumb topping and slight bitterness of the endive salad – a great combo showcasing that cooking with fire can really deliver something delicate and delicious. My next course was grilled duck wing confit with pomegranate, chiles and sesame which was a nod to Russ’s Korean heritage. Just imagine a very sophisticated version of Korean Fried Chicken – unctuous, tasty, sticky & spicy with a refreshing twist as the pomegranate pearls deliver little flavour bursts that cut through the rich duck meat. This was a taste explosion in the mouth. I tried to be a bit polite and eat them with a knife and fork but they just needed to be picked up and eaten with hands for the full effect, which I eventually did. 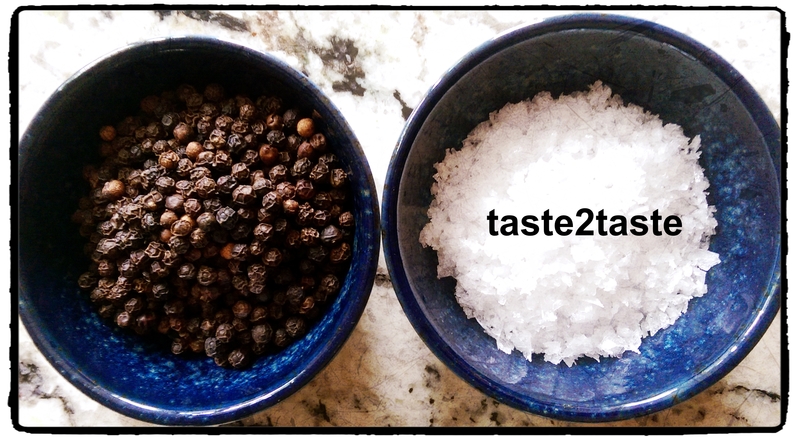 They were sweet, spicy, tangy and absolutely delicious. I had a glass of 2013 Trinafour Carignane, Mendocino County red, again the only local red available by the glass – which worked well with the duck in particular. 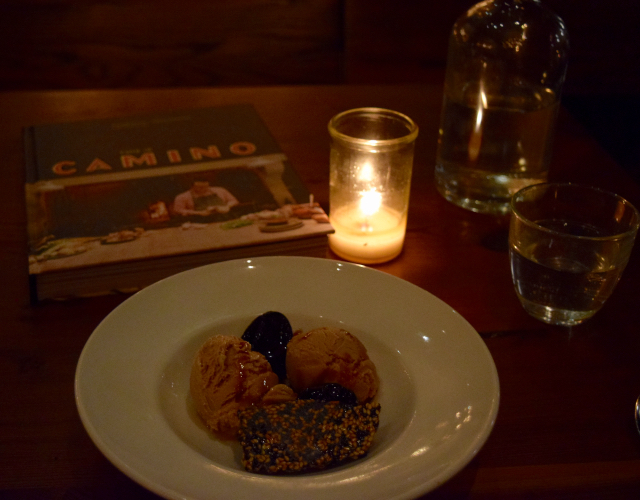 As a tea fan I was intrigued to try the dessert of Puerh ice cream with tea poached prunes and sesame candy. Puerh tea is a speciality of the Yunnan region of China and is fermented after the tea leaves have been dried and rolled into a ball. It worked really well as an ice cream with its hint of tannin, & smokiness with a creamy, velvety texture, not overly sweet and complimented the rich, dark fruity prune flavours and sweet sesame candy brittle. I was quite surprised and honoured at the end of the meal to meet Russ & Allison and the whole Camino crew which was a lovely gesture as I could thank them in person for a fantastic and memorable meal. I also have the cookbook as a great reminder although my living room gas fire and outdoor BBQ are not quite the same if I do take Russ’s advice to ‘start a fire’! 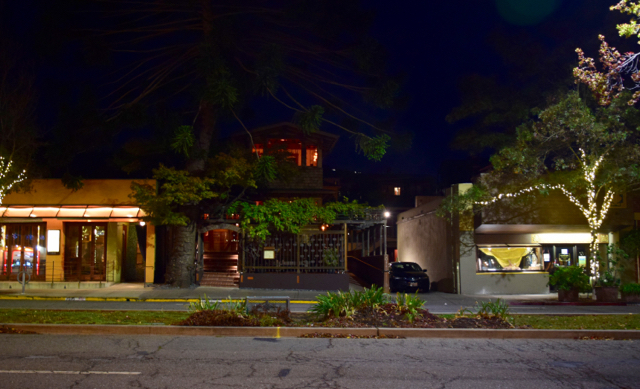 My East Bay area picks – Chez Panisse Café in Berkeley & Camino in Oakland – two amazing Californian restaurants – tune in for part 2!